The Garrett Superwand has a 360° detection field provides uniform sensitivity and tip pinpointing to detect weapons and other metal objects with extreme accuracy. From U.S. airports to sporting events, the lightweight SuperWand is the hand-held of choice for today’s security screener. Highvolume screening detector with versatile dual alarm mode which allows audible or silent search. Optimum sensitivity: detects ferrous, non-ferrous and stainless steel weapons, contraband and other metal objects. - Self-calibrating: digital microprocessor technology eliminates the need for periodic sensitivity adjustments. - Elongated profile provides 8.75” scan area 360° detection coverage plus tip pinpointing for easy scanning from head to foot. - Easy and convenient to use with one-touch button and threecolor LED lights. Green LED light indicates ON; Amber LED indicates LOW BATTERY: Red LED indicates ALARM. Power switch and LEDs positioned for easy access and high visibility. - Clear audible or Silent / Vibrate LED alarm signal. - Rugged injection molded construction including structurally isolated coil for added impact absorption. Exceeds Mil-Std-810F (drop test) Method 516.5, procedures II and IV. - Ergonomically designed grip fits comfortably in virtually any size hand. - Easy ON/OFF battery cover: standard 9V battery included. Optional rechargeable battery kit available. 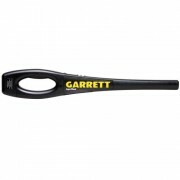 This Garrett Superwand can be delivered in 3 to 5 business days. If you would like to receive your order sooner, guaranteed 3 day, 2 day and next day delivery options are available upon checkout. Orders placed by 2:00 PM central time ship the day they are placed. If you have any questions or concerns call our customer support staff at 800.960.2015 or click the live chat button at the bottom of this page. Our courteous and professional customer support team is always glad to help!